UrbanGirl Jewels…Inspired by love & shiny beads! Long time UrbanPromise Trenton supporter, Diane E., was eager to volunteer at UPT. While she didn’t mind helping with homework, she was motivated to do something completely different with our students. One autumn Ms. Diane asked to teach some of our StreetLeaders how to make earrings. She supplied all the beads and everything else they needed to create some nice earrings. The teens made some beautiful earrings and we sold them when we visited various churches. 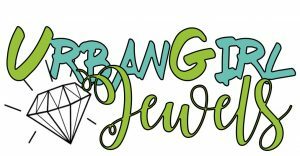 The project went on the back burner until last year when we resurrected it for our RiseUPTrenton event in May; UrbanGirl Jewels was born! This time, instead of working with our StreetLeaders, who were unavailable on camp days, Ms. Diane recruited our Junior StreetLeaders, students in grades 6, 7 & 8th grades to be the custom designers. And we had our “Dream Team”! Under the watchful eye of Ms. Diane, Bedess, Lovely, Nymanie, Winnie and Brijanae spent one afternoon each week for four weeks creating fun, beautiful earring designs to sell at our gala event. They chose beads and colors that suited their personalities. Bedess even named her earrings…”Tropical Night” and “In the Club” were two of her favorites! Ms. Diane created a lovely pop-up “store” for our event and everyone waited to see if UrbanGirl Jewels would appeal to our guests. UrbanGirl Jewels sold all but four pair of earrings, netting $600 in funds for our programs! The UrbanGirl team was thrilled! Flash forward to 2019…UrbanGirl Jewels is back again, preparing for our 2019 RiseUPTrenton Gala featuring Keynote Speaker, Ted Winsley. Each week, Ms. Diane and her team meet to create earrings, and new this year- bracelets and bookmarks! We also have a new team member, Jaya. Winnie is a StreetLeader now and is working during the afternoon. The young women and Ms. Diane have a great time working together; there is a lot of laughter during their creative sessions. Also, Ms. Diane now knows all about Cardi B! We look forward to featuring UrbanGirl Jewels at our event on April 25, 2019. You will get to meet our Design Team and have an array of lovely items to purchase with all the funds supporting UPT. We will be posting more about the Design Team with pictures of their jewelry on our Instagram: @urbanpromisetrenton. Feel free to check it out and we hope to see you at RiseUPTrenton on April 25, 2019.